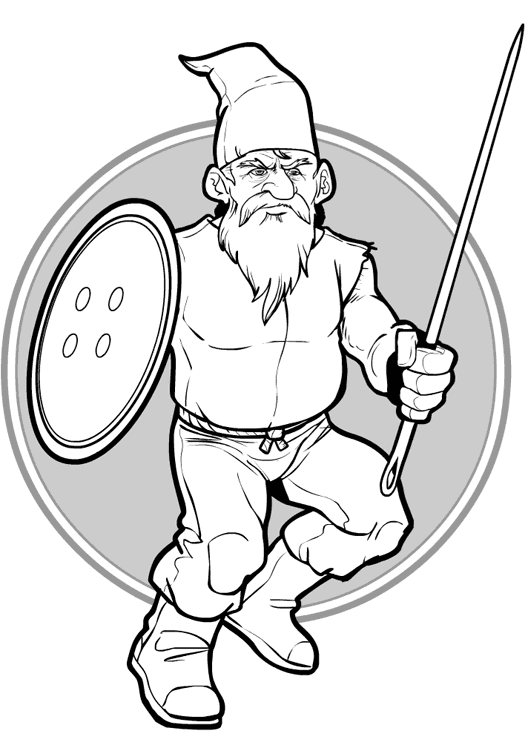 I keep calling this guy a gnome, but he's way too small for that if he's using a button as a shield and a needle as a sword. So he's like, um, a pixie gnome. Or something. I did a screencast of this one as well, with the added "bonus" that I got my microphone and recorded audio with it, explaining what I'm doing as I go. I lost track of time a bit and didn't actually finish it completely in the ten minute limit, but I get fairly close. Plus, this way people in the next room who can't see the screen can find me irritating as well. So that's nice. Let me know if the audio's too low or high or inane or whatnot. There's a weird sound periodically that sounds like I'm going "TKK!" with my mouth, but it's actually the keyboard clacking when I toggle between various digital tools (zoom, the hand to move the screen, undo, etc.). I literally just read about five stories about mysterious little people, and pixies on About.com’s true tales. Coincidences are odd. Sometimes I have so many I think I should write them down, but refrain from doing so in fear of it meaning I’m crazy lol. Really like the picture, you kind of illustrated those stories for me. Could He Be An Imp? I know, I sound like a girl. People routinely mistake me for my wife on the phone. Quite depressing. Nah, you don’t sound like a girl. You just don’t sound like your HM3 portrait makes you seem like you should sound. I believe the name for that little fellow would be a Brownie. He is the right size for a Borrower, they would use the button and needle. He could be a Brownie as well. It just depends on the books you read or the game you play. It’s like Elves, are they tall as in Final Fantasy XI, or are they short like Santas helpers? He could be a Gnome Midget. Clearly he’s a very physically fit brownie-pixie love child who’s got dwarfism. Duh. Lol, you’re right, that makes much more sense. Perhaps this guy is of regular height, and he’s just carrying a really big needle and button?